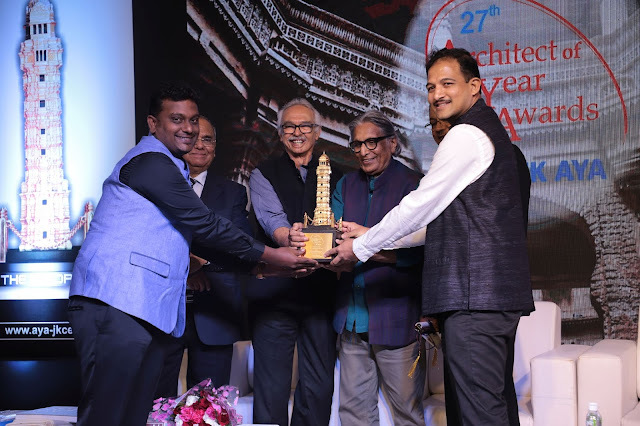 Ahmedabad, 30 July 2018: JK Cement Ltd, India’s premier cement company today hosted the 27th edition of Architect of the Year Awards in Ahmedabad to encourage and recognise outstanding talent in the field of architecture. The Architect of the Year Award is JK Cement’s annual flagship event that aims at recognizing and encouraging outstanding talent in the field of architecture on a global scale. The 27th edition of the JK Cement Architect of the Year Awards continued its legacy of getting an overwhelming response. The awards received 199 entries from India and neighboring countries like Bangladesh, Bhutan, Maldives, Mauritius, Nepal, Sri Lanka, among others. The prestigious award ceremony was graced by the iconic architect and Pritzker Architecture Prize laureate Mr. B.V. Doshi. The winners who were felicitated at the event were selected after much deliberation with industry veterans and architects across the globe. The revolving category of ‘Religious Architecture’ was bagged by Ar. Amritha Ballal & Ar. Suditya Sinha for their project ‘Temple in stone and light in Barmar’. This special category was aimed at acknowledging the sacred designs constructed over the years. The Architect of the Year award was won by Ar. Sharukh Mistry for their project Art and Innovation Hub-Agastya International Foundation in Bengaluru. Architecture Student of the Year was awarded to (Ms.) Ambika Malhotra for her work on project City Centre Redevelopment, Connaught Place Extension in New Delhi while the Young Architect Award was given to Ar. Rasika Naik for her work on Vivekananda Kendra Vidyalaya in Assam. (refer list). Apart from these, this year’s Green Architecture Award was won by Ar. Prasanna Morey for his project Kondan, The Retreat Resort, Pimpri in Pune. Like every year, AYA honours talent beyond boundaries with the FCAA Focus Countries’ Architect of thjeYear Award. This year, Ar. Palinda Kannangara from Sri Lanka was conferred with the Foreign Countries’ Architect of Year Award for Studio Dwelling project. Further commendation awards in various categories were also presented. The recipients of the award are selected through careful examination and scrutiny of the projects by an esteemed jury after intense debates and deliberations. The jury for AYA is chaired by Mr. Yadupati Singhania – Chairman & Managing Director, JK Cement Ltd. along with eminent architects from various regions of India. Born to the 129-year-old multi-disciplinary industrial conglomerate JK Organisation, JK Cement is one of the top ten producers of Cement in the Country. The Company has over four decades of experience in the cement manufacturing industry, having Grey Cement plants in Nimbahera, Mangrol and Gotan, Rajasthan and in Muddapur, Karnataka with a combined capacity of 7.5 MTPA. The Company is one of the only 2 producers of White Cement in India with a capacity of 0.6 MTPA, making JK White Cement the second largest manufacturer in the country. Other value added products include brands like JK Wall Putty, JK Primaxx, JK Super Grip and JK Water Proof Compound. The Company, which has been in existence in the market for over 30 years, exports White Cement to a number of countries across the globe.